The Extract Version Information action enables you to extract the Win32 Version and File Information stored in the executable. Extracting file information works with both normal Win32 files as well as .Net assemblies. Specify the field you want to extract. You may either select from the predefined types, or type in your own value. For most names, the "File Version Info" name reflects the name of a string in the file resources. The exceptions are "Product Version" and "File Version", which return the full version numbers. 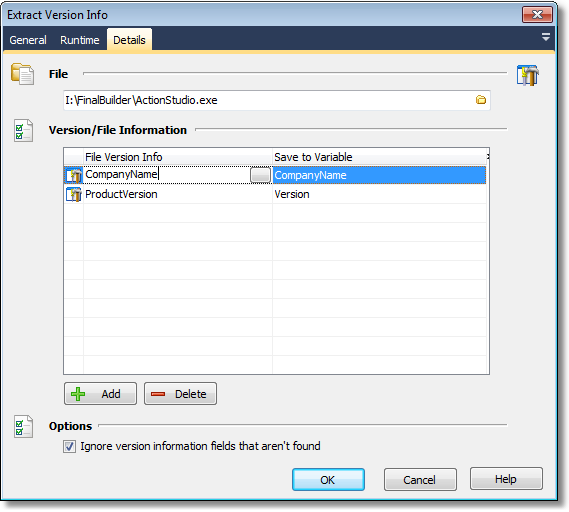 Specify the FinalBuilder variable to save the value to. Set this to ignore any fields that are not found. The variables will be set to a blank string.